Here’s your first fishing report of 2018. December saw some great days on the lake, with multiple fish caught most days. The first half of the month was action packed with 10 or more fish coming to the boat each day. But things slowed down a little for the second half of the month. 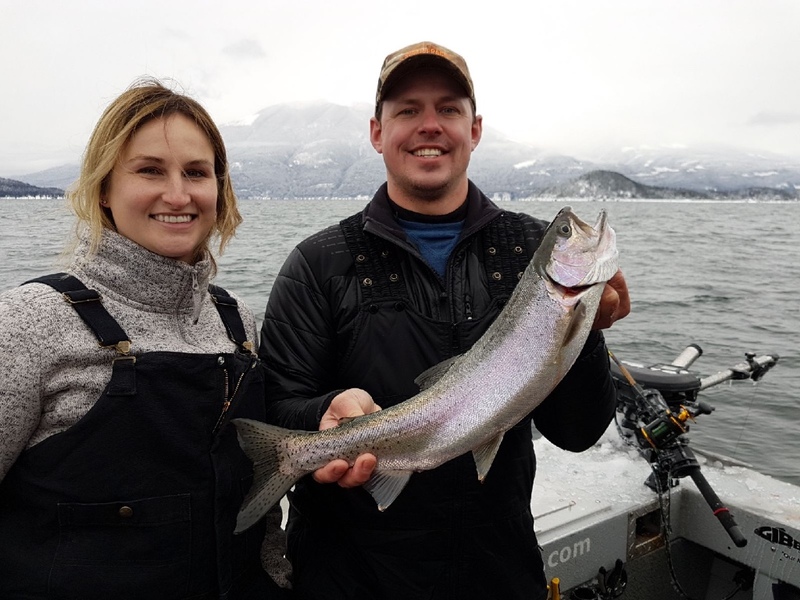 Our last few trips have seen between 5- 8 fish a day with the average size being 2 – 3 Lbs for the Rainbows, and 3 – 10 Lbs for the Bull Trout. Although, there have been a few Bulls up to 15 Lbs caught in the west arm lately. We had a busy holiday schedule with lots of tourists, and friends and families who joined us on the water. A nice way to mix it up a bit during the holidays. 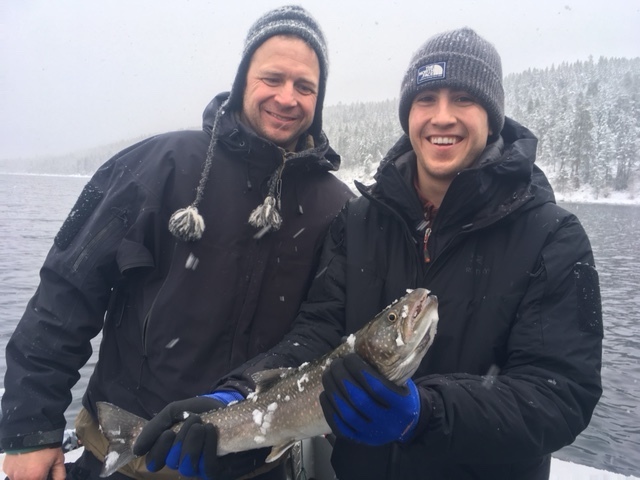 Also, a lot of skiers in town who have taken advantage of a day off to rest their legs and join us for a fishing adventure. Look forward to getting more groups from every corner of the continent throughout the rest of the winter. January can be a bit slower fishing, but some of the bigger fish can be caught at this time. So, it will be a trade off. We managed to get out a few times on the river when the weather has been mild, and each time we were rewarded with some nice fish. 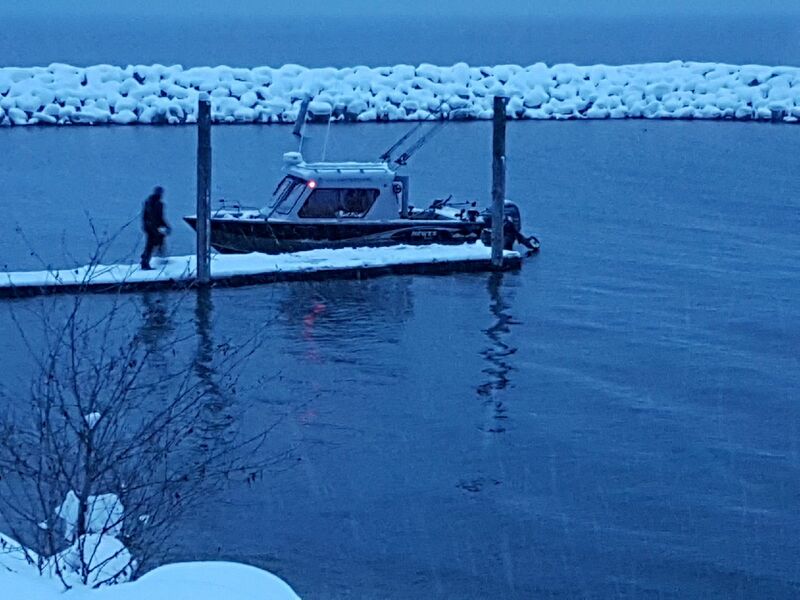 Mostly just shore fishing, or walking and wading since the boat launches have been covered with snow. But, that hasn’t kept the fish off the lines. On a few good days, we have managed to land more than 10 Rainbows. And the average sizes have been 2 – 3 Lbs, with a few up to 5 Lbs. These are all good fish when fishing with a spinning rod or fly rod. Looking forward to some more mild weather and getting out on the river more during January and February. A lot of the lakes around us are safe enough to fish through the ice now. Some of the best fishing happens from now until end of February. Some of our local watering holes have been: Cottonwood Lk, Erie Lk, Rosebud Lk, as well as Box and Summit Lk. Try your luck on the hard water this month for a rewarding experience. On the lake, we are still running an assortment of flies, spoons, plugs, and hockey sticks. Note the water temperature at this time of year, as it is usually the coldest it gets. You will need to slow down your presentation as the fish are not as aggressive. Common speeds for this time of year are below 2.3mph and sometimes as low as 1.8mph. You just have to experiment a bit. My favourite flies lately have been the November Special #207, as well as the bleeding gill # 210, and the usual black & white #234 has been working also. Purples and pinks are a good winter color, so be sure to mix it up. As far as spoons and hockey sticks go, the Gibbs/Delta Razorback spoons have been working well and some of the crocodile spoons in smaller sizes have been great. Also smaller hockey sticks in blacks, purples, and pinks have been working well. And on the River, its been a mix of float fishing with bait, or bottom bouncing with bait which has produced the most fish. Worms, Roe, or shrimp are popular choices.